In small nonmetal bowl, combine all dressing ingredients; mix well. Refrigerate. Cook lima beans as directed on package. Drain. Cook orzo to desired doneness as directed on package. Drain. In colander or strainer, rinse lima beans and orzo with cold water to cool. Drain well. 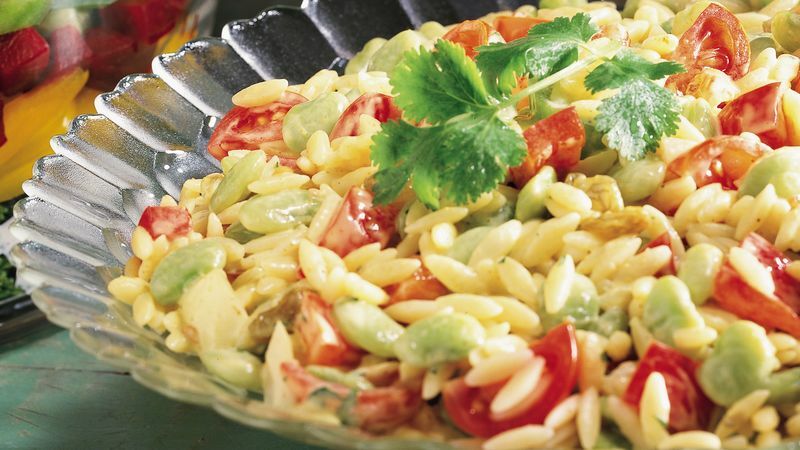 In large bowl, combine cooked lima beans and orzo, bell pepper, celery, raisins and onion; toss gently. Pour dressing over mixture; toss to coat. Refrigerate at least 2 hours to blend flavors. Just before serving, add tomatoes; toss gently. To serve, line plates with lettuce. Spoon salad onto lettuce. If desired, garnish with additional fresh cilantro. One and a half cups of frozen sweet beans can be used in place of the frozen baby lima beans. Sweet beans are raw soybeans; look for them in the frozen vegetable section at the grocery store, co-op or Asian market. Curries are traditionally served with lots of accompaniments. Try this salad with chopped toasted peanuts or cashews, toasted coconut, dried banana chips, sliced green onions and chutney. Place each garnish in a small bowl, then arrange bowls on a platter to pass around the table. Serve this curried pasta salad with sliced fresh mango and pineapple. Iced tea with fresh mint completes the menu.